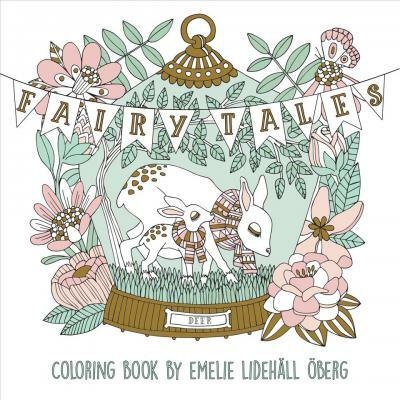 A debut coloring book for all ages from Swedish artist Emelie Lidehäll Öberg. Reminiscent of classic Swedish fairy tales, Emelie Lidehäll Öberg's debut coloring book fills 96 pages of sweetly sleeping animals, dolls come to life, and whimsical abodes. Color teacups, cuckoo clocks, birdhouses, peacocks, and fishbowls, and more. . . . This paperback edition makes coloring-on-the-go a breeze. Gold foil accents on the cover and enticing colorable French flaps make this a beautiful gift. The Fairy Tales Coloring Book will capture the imagination of the young and the young at heart. Emelie Lidehäll Öberg is a freelance illustrator. She has studied graphic design and illustration, as well as studied communications at Mittuniversitet in Sundsvall, Sweden. Emelie loves sharp lines, soft pastels and silhouettes from the past.